Administrators can close the feedback phase for certain Targets, but still keep it open for others. You can use the “Start or Stop Feedback for Targets” feature by following these steps below. Expand the Project Administration section. 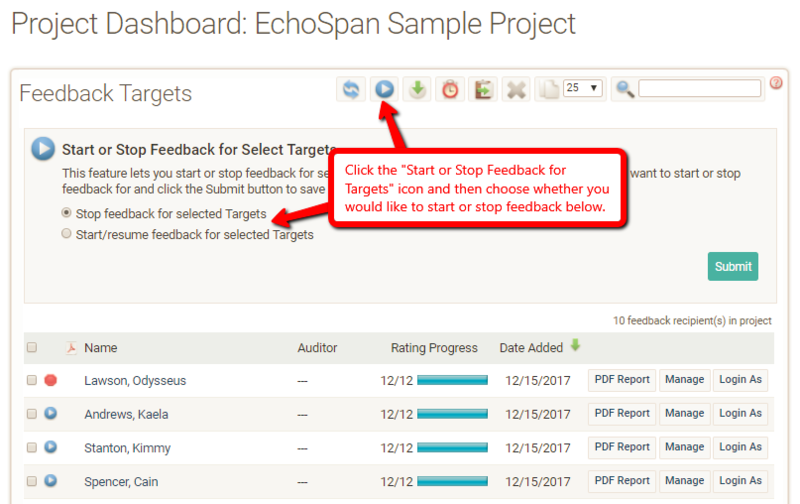 Turn ON the “Start and Stop Feedback for Individual Targets” feature. Click on the "Start or Stop Feedback for Targets" icon. Select whether you would like to Start or Stop feedback from the options. Check the boxes next to each of the Target’s names you would like to update. NOTE: This feature is only available with the Professional and Enterprise Editions of the EchoSpan tool.